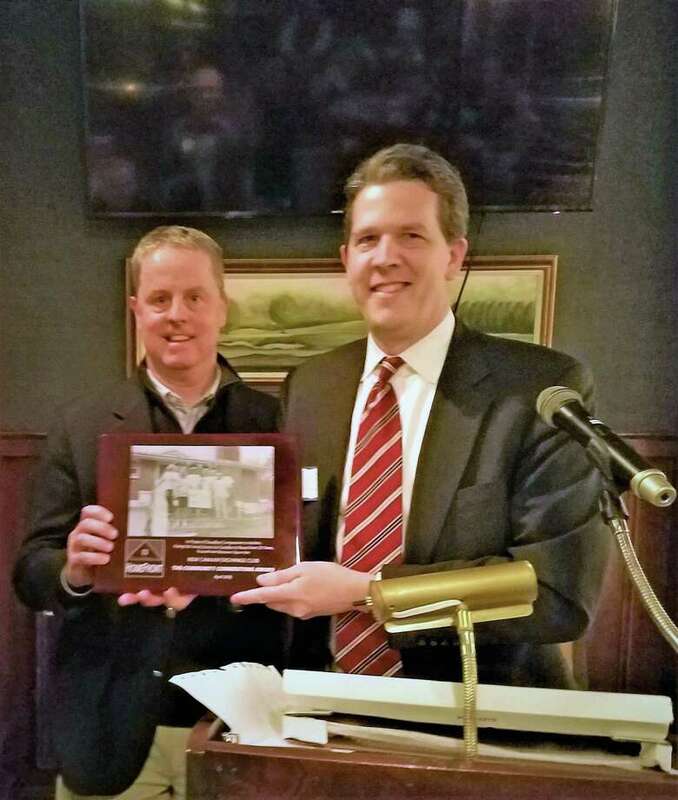 New Canaan Exchange Club President Jeff Platt, left, accepts the Community Cornerstone Award from HomeFront Executive Director Sean O’Brien during a recent meeting held at Woodway Country Club. The Moxie Project, a six-month intensive executive bootcamp was recently launched specifically to develop female influencers by Moxie-Leaders, a boutique consulting firm providing contemporary leadership development coaching and comprehensive workshops for organizations looking to build their high potential female executives, and to reach gender equity at the senior leadership level. Frustrated with the progression of women in leadership roles and old-school approaches to solving this business issue, founders Denise D’Agostino, Ellen Keithline Byrne and Karen Kirchner design and execute innovative programs specifically for female leaders using their collective research and decades of corporate leadership consulting experience. Participants in the Moxie Project are challenged to overcome their self-imposed limits and to expand their influence. Outcomes include increased self-awareness, knowledge to overcome roadblocks and enhanced decision-making capabilities. Participants in The Moxie Project have included women with leadership experience who are on the fast track to greater responsibility. The next 2019 executive intensive bootcamp begins Jan. 29 and will be hosted in Norwalk. For more information, visit moxie-leaders.com/moxie-project. HomeFront presented its Community Cornerstone Award to the Exchange Club of New Canaan during a recent meeting held at Woodway Country Club. The award is in recognition of The Exchange Club reaching its 25th year of fixing up homes with HomeFront for low-income families in New Canaan and surrounding towns. The Exchange Club has provided dozens of hands-on volunteers, leadership and precious donations that make these improvements possible. In presenting the award, HomeFront’s Executive Director Sean O’Brien said, “In the face of man-made, natural and economic disasters over these past 25 years, the Exchange Club has remained a dedicated friend to local struggling families. The American College of Surgeons has reverified Stamford Hospital as a Level II Trauma Center for another three years. As a Level II Trauma Center, Stamford Health provides 24-hour immediate coverage by highly trained trauma surgeons and physicians specializing in emergency medicine, anesthesiology, neurosurgery, orthopedic surgery, radiology, critical care, and trauma-trained nurses. In 2018, Stamford Health’s Emergency Department provided care to 55,300 patients. Of those patients, more than 860 patients were treated for a serious traumatic injury, ranging from age 0 to 101. The reverification process occurs every three years to ensure optimal care is given to trauma patients. The process includes an extensive ACS on-site review of the hospital’s education and professional development, standards of care, quality of patient care and assessment of outcomes. “Highlight: Gramercy” at The National Arts Club is the latest in a series of exhibitions, and is curated by Paul Efstathiou and Eleanor Flatow. The prestigious National Arts Club’s history of exhibiting art dates back to the founding in 1898, and its building epitomizes the spirit of The Gilded Age of New York. “Highlight: Gramercy” features works by eight emerging and established contemporary artists based in Athens, Vienna, New York City, Connecticut and Los Angeles. The artists included in the exhibition are Marcel Dzama, Amir Fallah, Andre Hemer, John Knuth, Liz Leggett, Olga Migliaressi-Phoca, Evan Robarts and Anne Vieux. Flatow, a native New Yorker, has held leadership positions at various art organizations over the past 20 years, including as a specialist at Christie’s and former executive co-director of the Carriage Barn Arts Center in New Canaan. Her background in the worlds of for-profit fine art, not-for profit institutions, and financial services informs her work as an entrepreneur in the arts. This is her second collaboration with Efstathiou. The exhibit will be on view from Jan. 31 to March 2. An opening reception will take place Jan. 31 at 6 p.m. in New York City.